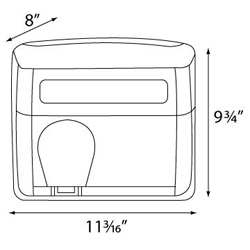 The Palmer Fixture HD0901-17 white conventional series hand dryer is a wonderfully consistent. This hand dryer is not only affordable but it is also extremely durable. Also available in Brushed Chrome. The automatic sensor on this unit is designed to conserve time and energy by only remaining active while the unit is in use. It features a drying time of 20 to 25 seconds. The measured RPM of this unit is 5500 and the operating airflow is 5514 LMF. This hand dryer also comes with a one-year warranty.